The Bobolink population is in decline. By one estimate half of the Bobolink population has disappeared since 1970. In Vermont the most recent Breeding Bird Atlas recorded a modest 6% decrease in block occupancy between the first and second atlases. Breeding bird survey data in Vermont revealed an annual decrease of of 2.1% between 1982 and 2007. Thus, Bobolinks are listed as a species of special conservation concern in Vermont. The explanations for this decline are multifactorial, but loss of habitat is a major factor. As Vermont's grasslands have reverted to mature forest or succumbed to development, suitable nesting conditions for Bobolinks have disappeared. More recently, intensification of agricultural practices, specifically hay mowing during the breeding season, has devastated Bobolink reproduction success. Studies by Allan Strong from UVM and Noah Perlut now at the University of New England demonstrated that fields cut in mid-June resulted in virtually 100% mortality among fledglings. Delayed mowing resulted in improved survival of fledged chicks. Enter the Bobolink Project. Organized by Allan Strong at UVM and colleagues at Mass Audubon, Connecticut Audubon, and the University of Connecticut, the Bobolink Project solicits private donations the proceeds of which are distributed to farmers willing to delay hay cutting until after the breeding season in June and July. In a process known as a reverse auction farmers submit bids to compensate them for the loss of value for hay that is harvested late in the growing season. Since its inception in 2013 the Bobolink Project has raised over $150,000. This project has been a resounding success. In 2017, for example, over 600 acres of prime grasslands in Vermont were protected. An estimated 229 breeding pairs occupied this territory, producing 639 chicks that otherwise might have been sacrificed to the blade. Overall in 2018 the project was able to fund two-thirds of the applications that were received, which protected 932 acres of grassland habitat on 20 farms (16 farms in Vermont). It is estimated that 368 pairs of Bobolinks were protected and that over 1000 Bobolink chicks fledged as a result. For the past two years Audubon Vermont has assumed administrative responsibility for this project in Vermont, while Strong and his colleagues continue to refine the process of protecting habitat while encouraging farmers to enroll in the program. Bobolink survival and dispersal are at the heart of Noah Perlut's long-term interest in protecting grassland birds. Starting as a graduate student at UVM 17 years ago, Noah has banded over 7000 Bobolinks and Savannah Sparrows at Shelburne Farms, then attempted to recapture them when they returned from their wintering grounds in South America. 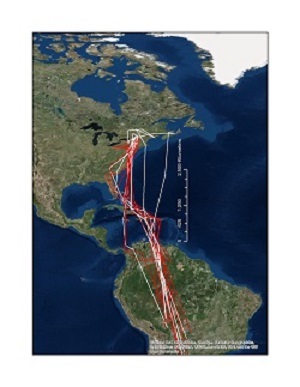 More recently he and his team of enthusiastic students have placed geolocators on some of these birds to identify their migration pattern and their wintering location in South America. Amazingly, these studies have documented that these small birds make a 6000 km journey from Vermont to South America and back every year, generally returning to within 1500 meters of their natal site in Vermont. The map on the right illustrates the migration of 13 Bobolinks sporting geolocators that Noah had placed on their backs in Vermont. Later these birds were recaptured and the data were analyzed. Many of these Bobolinks took the transoceanic route, flying non-stop hundreds of miles over open ocean to reach their final destination. Noah has presented the results of his continuing work in programs at Shelburne Farms and for the GMAS. His stories of Bobolink survival document the travels of the children, grandchildren, and great-grandchildren of the birds that he originally banded in Shelburne. For the past few years the GMAS has been pleased to participate in this work, surveying fields in Shelburne and Charlotte searching for banded birds, which Noah and his team later recapture. What about Bobolinks on their wintering grounds? The research group at the Vermont Center for Ecostudies has promoted the concept of "full life cycle conservation", emphasizing the importance of protecting birds on their wintering grounds and migration stopovers as well as at their breeding sites. Roz Renfrew from VCE has focused her studies on Bobolinks in Bolivia, Argentina, and elsewhere in South America (see previous HT blog entry, 4/29/2011). Here rice farmers regard Bobolinks as pests (the Latin name for Bobolinks Dolichonyx oryzivorous means long-clawed rice eater after all) and use active methods, including shooting them, to drive them from their fields. Once again balancing the needs of farmers with those of the birds is the key to successful conservation efforts. Bobolink populations are in decline, true, but sustained efforts in Vermont by conservation biologists at UVM, VCE, Audubon Vermont, and the University of New England have successfully mitigated some of the factors leading to this decline. Currently, the Bobolink population is estimated at 8 million birds. Thus, the mantra "Keep common birds common" is especially applicable to the plight of the Bobolink.